I'm happy to be participating in the Eat. Live. Be. Challenge. Last week, I wrote about my goals for 2011. This week, participating bloggers have been asked to write about our support community - where we turn for support/community in our health goals. Let me give you the bad news first. There is no one who's involved in my everyday life who gives me a 'push' to stick to my health goals. In our family, I'm the leader, the one who has to set the tone for everyone else to eat healthy. If I come home from the grocery with a truckload of Oreo cookies or Reeses Peanut Butter cups instead of whole grain granola bars, my kids roll out the red carpet for me. (They have one reserved for just this eventuality.) If I serve up fast food burgers for dinner instead of grilled chicken and brown rice, I get a round of applause. I am the strong one, the one who has to withstand the pressures of unhealthy eating and who has to make sure we eat reasonably nutritious, unprocessed foods. The good news is that I find lots of support online and by reading healthy eating books. I have a huge supply of books and magazines that help me stay focused on my goals, and I make it a point to read them regularly. I visit loads of healthy eating blogs and forums, and I have developed online relationships with others like me, who are committed to a healthy lifestyle. Here are some of my favorite print and online resources. Healthy eating cookbooks: I have a ba-zillion of them, but here are my current top picks: Moosewood Cookbook , Enchanted Brocolli Forest , Moosewood Restaurant New Classics , How to Cook Everything Vegetarian , and The Art of Simple Food . Healthy eating blogs: The blogs listed at the bottom of this post are a great place to start. Other favorites - Green Gourmet Giraffe, Jenn's Food Journey, Kirsten's Kitchen, Cooking Outside the Box, What Megan's Making, and of course the classic 101 Cookbooks and Simply Recipes. What books and blogs do you turn to for inspiration? What gives you the support you need to meet your healthy living goals? Here's a list of other bloggers participating in this challenge: Sarah, Cate, Maris, Chris, Faith, Kristen, Emily, Jenna, Joanne, Casey, Patsy, Tri-Fit Mom, Claire, Allison, Jen and Leslie. Thanks for referencing my blog! I really appreciate it. I try my hardest to post as many healthy recipes as I can.... this time of the year is probably the worse cause I crave warm heavy comforting meals because I can't stand the cold!!! Good luck to you on this....I know you will do great!!! 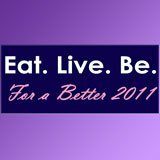 Thanks for the great list of healthy food blogs. Thanks so much for sharing this! it is really hard to keep to healthy eating when you have to motivate not only yourself but your family as well! Keep at it chica! those books sound wonderful. I love moosewood and the vegetarian Times. Great resources! And thanks so much for the award! I really appreciate it. I understand how that is. I also largely set the tone for my family. It's hard, but I feel good making good decisions (although there are some nights when all I want is to curl up with a bucket of KFC).